While the Accidental Locavore isn’t usually much of a baker (no patience for following directions), occasionally one needs to come up with a dessert, especially around the holidays. I saw this from Dorie Greenspan’s new book, Baking Chez Moi and thought it looked like something I could do. This isn’t difficult, you just have to be careful with the caramel and pull it off the heat when it starts to get golden. Makes a 9” tart. For the pastry: In a food processor, pulse together the flour, confectioners’ sugar and salt. Add the butter and pulse until it’s the size of small peas. Add the egg yolk and pulse in 10-second increments until incorporated (about 4 long pulses). Transfer the pastry to a sheet of parchment paper, pat it into a disk and cover with another sheet of parchment paper. Roll out the pastry to a 12” round. Slide the whole thing onto a baking sheet. Refrigerate until firm, about 1 hour. Remove from the refrigerator and let the pastry stand at room temperature for 5 minutes to soften. Discard the top sheet of parchment paper and invert the pastry into a 9-inch fluted tart pan with a removable bottom; fit the pastry into the pan and trim the overhang. Prick the pastry all over with a fork and refrigerate for 30 minutes. Preheat the oven to 400°. Line the tart shell with parchment paper and fill with pie weights or dried beans. Bake for about 20 minutes, until the pastry is set and lightly browned at the edge. Remove the parchment paper and weights and bake the pastry for 5 minutes more, until lightly browned on the bottom. Transfer to a rack to cool completely. Reduce the oven temperature to 325°. For the filling: In a microwave-safe small bowl, microwave the chocolate in 30-second bursts, just until melted. Let cool slightly. 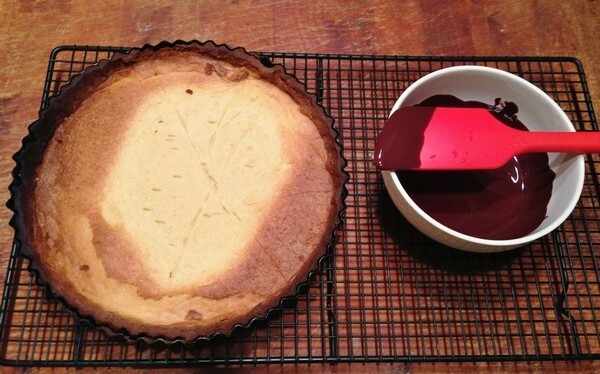 Pour the melted chocolate into the baked tart shell, spreading it evenly over the bottom and set aside. In a small skillet, stir 1/3 cup of the granulated sugar with the lemon juice and ¼ cup of water over moderately high heat until the sugar dissolves. Cook, without stirring, until the mixture starts to color, about 5 minutes. Continue cooking, stirring constantly with a heatproof spatula, until a lightly golden caramel forms, about 5 minutes. Remove the skillet from the heat and stir in the butter, 1 piece at a time. Stir in the cream and salt then let the caramel cool to room temperature. In a medium bowl, whisk the egg yolks with the remaining 1/3 cup of granulated sugar until smooth. 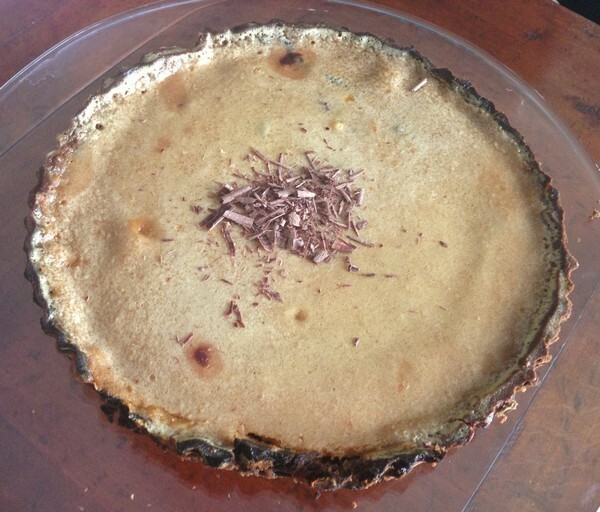 Slowly stir the caramel into the egg yolk mixture then pour the custard evenly over the chocolate in the tart shell. Transfer the tart to a foil-lined baking sheet. Bake for about 30 minutes, until the crust is browned and the filling is still slightly wobbly in the middle. Transfer the tart to a rack and let cool to room temperature. Refrigerate until set and thoroughly chilled, at least 2 hours. Unmold, serve and enjoy! My verdict: Cream, chocolate, caramel, butter, what’s not to like? Although this takes a bit of time, it’s definitely worth it! Be sure to have the cream at room temperature (or even a little warm) as it will harden the caramel if it’s too cold. That’s really the only tricky part. The crust is a good one and would go well with other fillings. If you don’t have pie weights or beans, small dried pasta (like macaroni) works well. I garnished my tart with a little shaved chocolate, but if you needed to be trendy, you could sprinkle a little Maldon salt on top. yum! …….just found out you can melt chocolate with a hair dryer: you chop or break the chocolate (make sure it’s dry) into small pieces, and put it into a bowl. aiming the dryer eight to ten inches away and pointing it straight into the bowl, turn it on and move it around, stirring slowly until the chocolate is melted and smooth……….voila! !